What is math? And how exactly does it work? 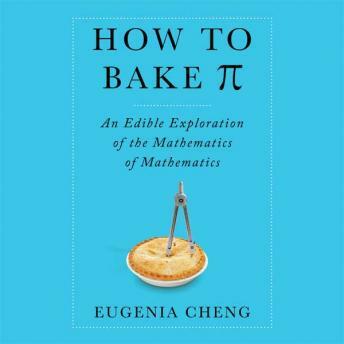 In How to Bake Pi, math professor Eugenia Cheng provides and accessible introduction to the logic of mathematics-sprinkled throughout with recipes for everything from crispy duck to cornbread-that illustrates to the general listener the beauty of math. Rather than dwell on the math of our high school classes, with formulas to memorize an confusing symbols to decipher, Cheng takes us into a world of abstract mathematics, showing us how math can be so much more than we ever thought possible. Cheng is an expert on category theory, a cutting-edge subject that is all about figuring out how math works, a kind of mathematics of mathematics. In How to Bake Pi, Cheng starts with the basic question 'What is math?' to explain concepts like abstraction, generalization, and idealization. By going back to the logical foundation of the math we all know (and may or may not love), she shows that math is actually designed to make difficult things easier. From there, she introduces us to category theory, explaining how it works to organize and simplify the whole discipline of mathematics, bridging the gaps between different mathematical concepts and shedding light on some of math's most puzzling mysteries. Though the ideas are far from simple, Cheng outlines everything in crystal-clear terms, drawing on a wide range of analogies and examples to show that doing math uses the same skills we rely on when we read a map, cook a new dish, or complete a jigsaw puzzle. The result is a book that combines some of the most satisfying features of popular math books-the thrill of truly understanding things that may or may not have been confounding in high school, while still look long and hard into unexplored territory. Through lively writing and easy-to-follow explanations, How to Bake Pi will take even the most hardened math-phobe on a journey to the cutting edge mathematical research.